This soft, delicate Apricot Galette is full of fresh apricot flavor with hints of cinnamon and sugar, so easy and it’s vegan! For over a year now anytime I read a cooking magazine or watch the Food Network, when I see a beautiful galette I always think I should make that! I love the beautiful, rustic quality they possess. Well a few weeks ago while browsing foodgawker late one night I ran across a vegan recipe for my sister. FYI – if you follow me on Pintetest and have been wondering about my “Recipes for Amie” board, it’s all vegan. Anyway I clicked through to j3nn.net to pin the recipe and she was having a giveaway for coconut oil. I’ve been intrigued for some time now by this tropical oil and so I entered. Let me tell you I was more than surprised the next morning to find an email from Jenn saying I had won, thanks again! My oil arrived Saturday, if you’re in the market for some I highly recommend Tropical Traditions. They put forth a true quality product, backed by great service and speedy delivery. I wasn’t sure how this galette would turn out never having used coconut oil before. So I skimmed a few recipes and decided to freeze my oil to solid so I could use it as a butter substitute. The result was great, it was soft, delicate and full of fresh apricot flavor with hints of cinnamon and sugar. I’ll make this again for sure when my sister visits, since it’s also vegan. I can’t wait to try honey next time instead of sugar and experiment with different kinds of fruits – enjoy and happy baking! In the bowl of your food processor, combine the flour, sugar, and salt and pulse to mixed well. Add the 1/4 c diced coconut oil and pulse several times until it is pea sized. Slowly add the ice water, a tablespoon at a time, pulsing after each addition, until a dough begins to form. Turn out the dough onto your counter and shape into a disc, wrap in plastic and chill for 30 minutes. Preheat your oven to 425°F and line a baking pan with parchment, set aside. Roll out your dough to 1/4" thick and arrange the apricot slices in a circular, overlapping fashion. 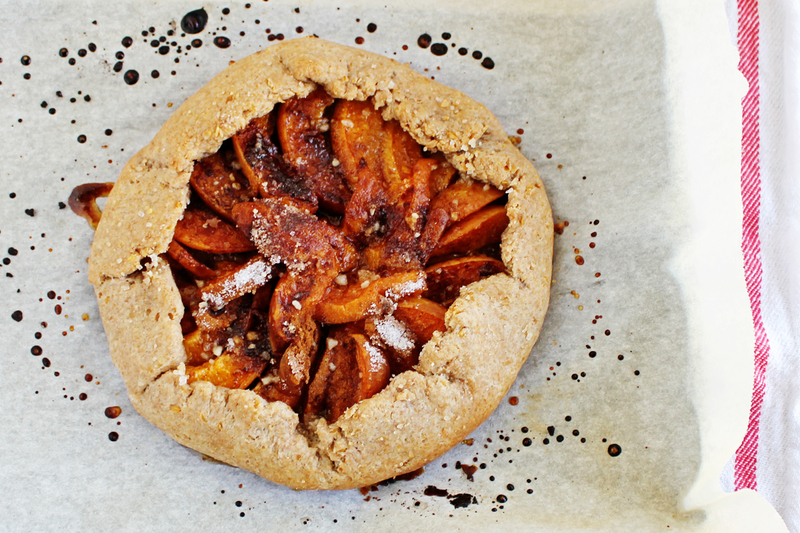 Sprinkle the tsp of sugar and the cinnamon over the apricots, dot the 1/2 tsp coconut oil on top and fold the edges of the dough up, all the way around the pastry. Bake for about 18-20 minutes, until browned, remove from the oven and cool on the pan, serve warm. I love making galettes because of the rustic look! My dough making skills are lacking, so these are perfect for me!! Yours looks incredible!! Thanks! My dough skills are ok, I’m by no means a pro, but this was such an easy and beautiful dessert to make! I love these galettes and think it’s about time I try making one! galettes are one of my absolute favorite things to make. They turn out so rustic and beautiful! I just made some heirloom tomato galettes last week! I’m sure I’ll be making lots of these from now on! Emily, I need you to open a bakery next to my house so that I can buy your wonderful creations everyday! YUM!